20th Century Fox’s “X-Men: Apocalypse” reigns supreme at the box-office with its PhP 230 million opening weekend (first five days) in the Philippines in 476 screens. It also dominated and opened number one on its first day of release (opened May 18) in the country with PhP 45 million in box-office receipts. In the Philippines, “X-Men: Apocalypse” has taken the franchise to new heights with its strong box-office results. It now holds as the Biggest Fox Opening Weekend All-Time, tracking 131% higher than “X-Men: Days of Future Past.” It is also now the Biggest Non-Holiday May Opening Weekend All-Time. Ultimately, “X-Men: Apocalypse” records show that it is now the Biggest Opening Weekend in the X-Men franchise. “X-Men: Apocalypse’s” powerful presence recorded strong box-office receipts from the following top twenty (20) cinemas: SM MEGAMALL (11million), SM MALL OF ASIA (10.1M); TRINOMA (8.1M); SM NORTH EDSA/THE BLOCK (8M); GLORIETTA (6.2M); POWERPLANT (4.3M); SM CEBU (4.3M); GREENBELT 3 (4.1M); GATEWAY CINEPLEX (3.99M); ALABANG TOWN CENTER (3.95M); BONIFACIO HIGHSTREET (3.8M); AYALA CEBU (3.6M); THEATREMALL (3.6M); SHANG CINEPLEX (3.38M); MARKET!MARKET! (3.31M); EASTWOOD (3.25M); ROBINSON’S MAGNOLIA (3.15M); SM AURA (3.13M); UPTOWN (3.03M); NEWPORT (2.7M). Bryan Singer’s return at the helm of the franchise in “X-Men: Apocalypse” along with beloved mutant characters pitted against the most powerful of their kind has generated coherent rave buzz among its fan base round the globe despite polarizing reviews from some critics. 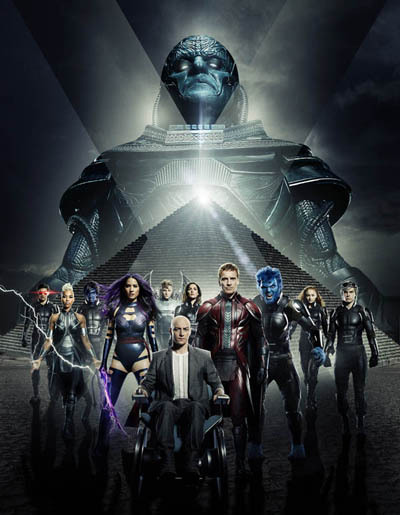 “X-Men: Apocalypse” brings returning and new characters on the big screen led by James McAvoy, Michael Fassbender, Jennifer Lawrence, Nicholas Hoult, Evan Peters and Rose Byrne with young and equally powerful mutants played by Sophie Turner, Ben Hardy, Tye Sheridan, Alexandra Shipp. Kodi Smit-McPhee and Oscar Isaac. In the movie, the invincible and immortal Apocalypse is set free after being entombed for several millennia. Enraged that his kind are no longer treated as gods, Apocalypse assembles a team of powerful mutants, including a disheartened Magneto, to destroy humankind and create a new world order, over which he will reign. To end Apocalypse’s path of global destruction, Raven (Jennifer Lawrence) and Professor X (James McAvoy) lead a team of young X-Men in an epic showdown with a seemingly unstoppable enemy. “X-Men: Apocalypse” is now showing in cinemas across the Philippines from 20th Century Fox distributed by Warner Bros. Available in 2D, 3D, 4D and IMAX screens nationwide.